Click for a copy of our certificate. US Congressman David Jolly recently toured Robotic Parking Systems‘ manufacturing facility in Clearwater, FL where he received a demonstration of the company’s innovative automated parking technology. Congressman Jolly represents Florida’s 13th Congressional District which covers Pinellas County where the company is located. As a member of the Subcommittee on Transportation, Housing and Urban Development, he understands transportation issues and how more efficient and space-saving parking can assist urban development projects. Increases individual safety and reduces the risk of injury. Premium valet service without the tip. Virtually eliminates dings and dents as well as theft and vandalism. Protects cars from the elements. Average time for storing or retrieving the car is 150 seconds. Cars are transported free of touch on separate pallets. Easy to use. Drive forward to enter and forward to exit the facility. Creates more space for design and development. Can be constructed in every form — above ground, underground, on roofs or inside a building complex — in steel or concrete. Space gained can be used for green space and open areas to meet LEED standards. Modular and flexible capacity for hundreds to thousands of cars. Can be designed for every level of traffic density. More than 4 times the parking capacity on the same land. Ideal solution where space is limited or land cost is at a premium. Reduces operating costs — less personnel, less ventilation and lighting, etc. 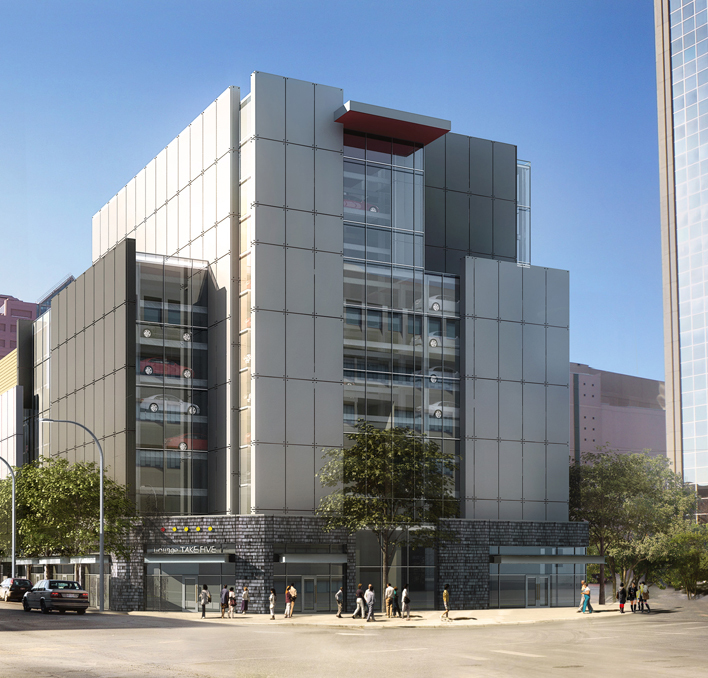 Flexible design and façade allows the robotic parking garage to fit into any neighborhood or project. Reduces liability. No public enter the area where cars are stored. Not dependent on a single retrieval mechanism. Full redundancy and fail-safes. No single failure will ever result in the system being inoperable. If a single robot fails another identical machine takes over. Reduces CO2 emissions, other pollutants and greenhouse gases. Eliminates tons of highly toxic tire and brake dust every year. Valet ease, but you keep the keys. Architects and developers have complete freedom in designing the external appearance of a robotic parking facility – imagination is the only limit. Any type of façade (brick, living wall, concrete, aluminum or glass) can hang onto the clean outside structural support system of a Robotic Parking garage. All of the machinery, lifts and automation components are installed inside the supporting structure and never interfere with the façade. This ensures that the garage can fit harmoniously into any project or neighborhood. Entry / exit terminals can also be integrated into the façade environment, while observing both visual as well as functional criteria. 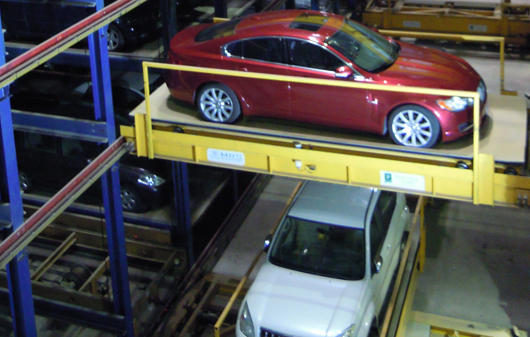 The Robotic Parking System can be constructed in every form — above ground, underground, on roofs or inside a building complex. 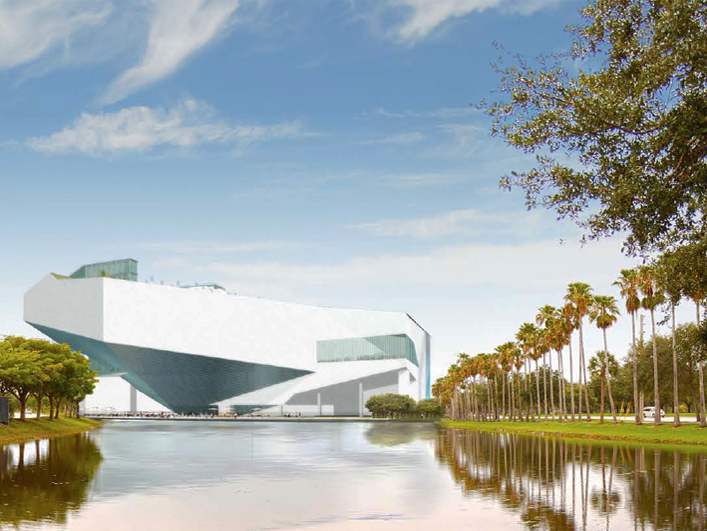 Here are a few examples of project designs that incorporate robotic parking. Is the Robotic Parking System suitable for handicapped persons? Robotic Parking Systems designed the standard entry / exit terminals to be suitable and comfortable for the handicapped. The minimum width of each terminal is 4755 mm / 15.6 ft. which is compatible with the requirements of the ADA – American Disability Act. Author maryloudewyngaertPosted on January 15, 2013 Categories Automated Parking, General, parking, robotic parking, Robotic Parking SystemsTags Automated Parking, car park, parking design, robotic parking, Robotic Parking SystemsLeave a comment on Is the Robotic Parking System suitable for handicapped persons?